We harvested a total of £70 worth of veg this week, excluding anything from the store. We had over 40 meals with ingredients from the allotment and contributed to two other families. Here’s a photo of one of the harvests. 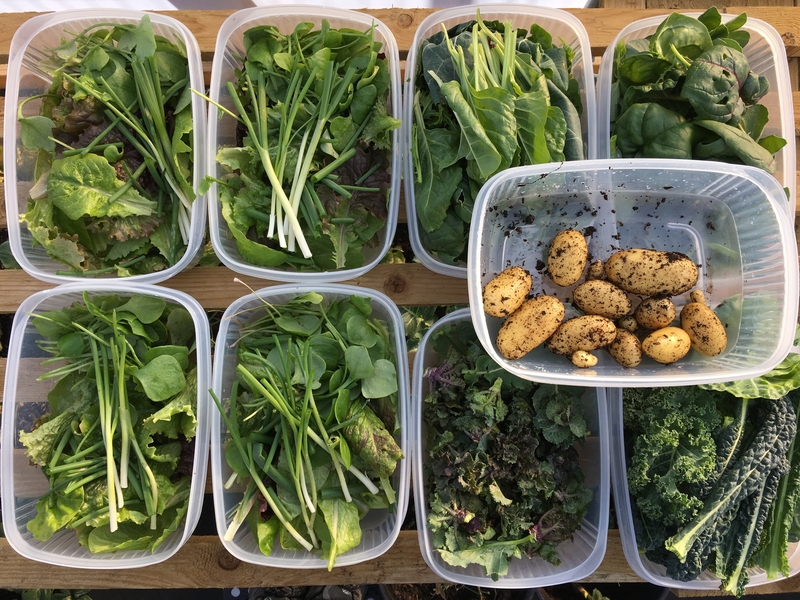 We picked new potatoes, broccoli, sprouts, brocollini, lots of types of kale, chard, kalettes, golden beets, spring onions, celery, rocket, lots of bean tops, spinach, claytonia and loads of lettuce. We also raided the store for: carrots, potatoes, onions, shallots, garlic, red beetroot and dried pears/apples. Then a video of me mulching the fruit trees and preparing the polytunnel for a few days of hard frosts. Dried pears used to cost us a lot, now free, we’ve paid for the dehydrator in pears alone! I’m almost over the dreadful itchy rash! The mix of mild then cold weather is weakening a lot of the salads and we are losing quite a few to various fungal diseases, but we have enough. Next story Mulching Fruit Trees and Keeping Busy When It’s Freezing!